Description: Session 2 of the Yatai Bayashi course reinforces and develops upon the concepts expounded in Session 1 under the contexts of creating a working performance arrangement of Yatai Bayashi for students. In this session, students will have the opportunity to perform an arrangement of Yatai Bayashi at the Asano Taiko US/LA Taiko Institute Bonenkai (End-of-the-Year Party) Recital in Torrance on Saturday, 12/3! Through the arrangement, students will experience and develop Ne-uchi and Suwari-uchi (also called Zassou Gamae) styles of taiko at both the individual and group levels. This course does not ascribe to a sole arrangement of Yatai Bayashi, but rather combines the instructor’s in-depth experience studying for years under multiple artists and groups including the principal arranger of Yatai Bayashi, Eitetsu Hayashi; as well as KODO; Kaoru Watanabe; and Marco Lienhard. In this manner, students may find a path of understanding to make Yatai Bayashi and its style of playing part of their own taiko journey and expertise. -Incorporating lower body rocking, ribcage, shoulder blade awareness. -Ability to maintain control between large and small striking patterns. -Ability to run Uchipanashi drill at a variety of tempos. -Introducing Tamaire rhythms for shimedaiko. Participation in Session I or prior experience with Yatai Bayashi or its style of taiko (or at the discretion of the instructor). Yatai Bayashi was arranged initially in the early 1970s primarily by solo taiko artist Eitetsu Hayashi, then a young member of the famous taiko group Ondekoza. Members had received a week’s instruction in the original folk music under Takano Ukichi, the leader of a local preservation society, followed up by a visit to Chichibu for additional instruction and observation of the Yo-Matsuri festival during which the music is performed. Despite returning to Sado with field recordings, they encountered difficulty with the off-set, shuffled nuance of the base rhythm; and found the semi-improvisational phrases of the main chudaiko drum too complex to remember. As a compromise, Hayashi used his transcriptions to piece together set rhythmic phrases, while modifying the off-set shuffle of the base rhythm into a straight beat. Additionally, the leader and artistic director of Ondekoza, Tagayasu Den, formulated the piece’s staging, playing techniques, and aesthetics around members playing large chudaiko drums while sitting in an exaggerated sit-up position in order to display performers’ physical endurance, stoicism, and speed. Ondekoza’s Yatai Bayashi and that of its descendant group, KODO, not only astound audiences to this day, but have also inspired taiko groups worldwide into crafting their own respective arrangements or pieces using the iconic form. Yatai Bayashi represents an integral portion of the fabric of the contemporary taiko drumming’s neo-folk tradition. -Explanation of folk historical contexts of Yatai Bayashi, differences in notable arrangements. Joe Small's passion for taiko began as a Swarthmore College dance major in 2002, leading him to receive formal instruction under Kenny Endo at Taiko Center of the Pacific, intern with San Jose Taiko and Portland Taiko, and study abroad at Tokyo's Tamagawa University where he performed with their taiko-dance group. Following graduation, he became a Fulbright Fellow to Japan to research taiko and choreography (2005-2006), an apprentice to the professional group KODO (2007-2009), and a member of the Marco Lienhard’s NYC-based Taikoza (2009-). In 2012 Joe began an apprenticeship under pioneering solo taiko artist Eitetsu Hayashi, including another two-year period in Japan where he toured and performed as a member of his professional ensemble, Fu-Un no Kai. In 2015 Joe debuted his first original evening-length concert, Spall Fragments and was a guest artist for the Sydney-based professional group TaikOz. As of 2016 Joe has begun teaching at LATI and this summer conducted his first concert tour. 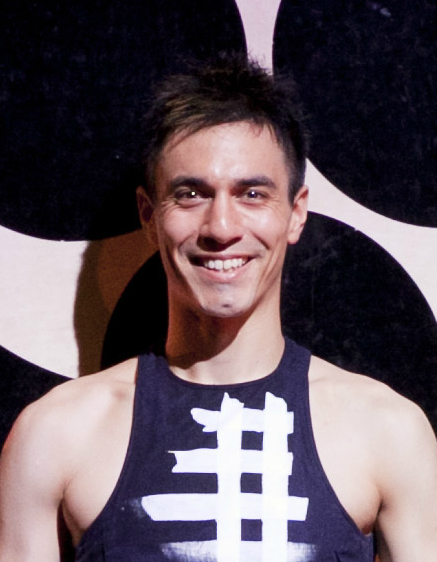 Joe is a 2005 graduate of Swarthmore College (BA, Dance) and a 2015 graduate of UCLA's Department of World Arts and Cultures/Dance (MFA, Dance) where he explored the cross-disciplinary possibilities of mixing taiko with postmodern choreography. He resides in Los Angeles where he performs, creates, and educates collaboratively and as a solo artist.